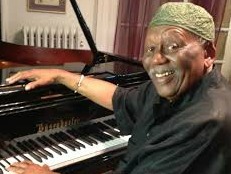 The Jazz Journalists Association has named 89-year-old pianist, composer and bandleader Randy Weston winner of the JJA’s Lifetime Achievement Award for 2015. Weston’s 66-year career began in his native New York. In his early years it included work with Art Blakey, Bull Moose Jackson, Eddie Vinson, Kenny Dorham and his childhood friends Cecil Payne and Ray Copeland. He was a key figure at Music Inn in Lenox, Massachusetts, during the institution’s influential years in jazz education. Also in the 1950s, he initiated the jazz policy at New York’s Half Note Café. Weston’s lifelong interest in Africa intensified when he played in Nigeria in 1961. Since then he has performed frequently in several African countries and for a time lived in Morroco. Many of his more than fifty albums have African themes or exhibit African influences. It is likely, however, that Weston’s best known composition remains “Hi Fly,” recorded at the Five Spot Café in 1959 with an all-star cast of Weston, Coleman Hawkins, tenor sax; Kenny Dorham, trumpet; Wilbur Little, bass; Roy Haynes, drums; and an arrangement by Melba Liston. Weston tops a list of 31 winners of the 2015 JJA awards, among them Jason Moran, musician of the year; Cecile McLorin Savant, up and coming artist of the year; Wadada Leo Smith, composer of the year; Maria Schneider, arranger of the year; Kenny Barron and Dave Holland, record of the year, for their The Art of Conversation. To see the entire list and photographs of the winners, go here. Hearty congratulations to all. Congratulations to you and your students. That’s terrific! Thank’s for posting this cut. I have it in my stacks and, no, I can’t bring myself to download them or anything else; I feel more secure with them around and that goes for my thousands of CDs as as well. Randy Weston has one of favorite musicians and it’s well-deserved,albeit long overdue.